Copyright © 2017, Environmental Hope and Justice. All Rights Reserved. Special thanks to Environmental Progress for support for this report. The closure of the San Onofre Nuclear Generating Station (SONGS) and the planned closure of the Diablo Canyon Nuclear Power Plant (DCNPP) represent an environmental injustice because these actions will increase air pollution in vulnerable communities and nonattainment areas. For the purposes of this report, environmental justice areas are all areas that are in nonattainment for smog. Environmental justice groups and other environmental groups should support nuclear power due to its emission free nature. Environmental justice groups in California should support reopening SONGS and should support continued operation of Diablo Canyon Nuclear Power Plant. These plants do not release smog forming and greenhouse gases and they replace emissions from fossil fuel-fired power plants. Although the vast majority of California is in attainment for NO2, it is largely in nonattainment for ozone and particulate matter. NO2 along with other NOx reacts with other chemicals in the air to form both particulate matter and ozone. Both of these are also harmful when inhaled due to effects on the respiratory system. This report illustrates how electricity market decisions can work against the best interests of vulnerable communities. There are Federal sanctions for states that are in nonattainment for criteria pollutants. One sanction prevents economic development from increasing emissions in areas that are already violating the air quality standards. Another sanction requires a prohibition on Federal funds for transportation projects within an area that is violating air quality standards. These sanctions do not appear to be effective in bringing urban and suburban areas into attainment for ozone, a primary component of smog. Although there are laws such as the Clean Air Act and other statutes designed to address vulnerable environmental justice communities, none of them can cancel a planned polluting project and those provisions do not provide adequate protection for these neighborhoods. The State Implementation Plans (SIP) are disconnected from approval or disapproval of individual development projects and highway construction and Clean Air Act sanctions are rarely effectively applied. The Clean Water Act is being used by states that are hostile to nuclear power to close the plants by requiring them to build cooling towers. It is a backdoor way to close the plants. No nuclear plant in the world has been retrofitted with cooling towers. Requiring them to do so is an experiment that utility companies will not make. Wedge wire screens are the best technology available for mitigating impingement and entrainment of marine organisms. The single most valuable tool that vulnerable environmental justice communities have to mitigate the negative health effects of air pollution is nuclear power. In California, if nuclear plants could be combined with a significant number of electric vehicles, mitigation of smog would be a real possibility. These plants do not emit smog-forming or greenhouse gases. California’s SIP should put SONGS and DCNPP at the top of their list for meeting the requirements of the Clean Air Act. These nuclear power plants are assets that should be utilized to the maximum extent possible. Southern California Edison’s SONGS should replace its faulty steam generators and continue operating for as long as possible. Pacific Gas and Electric (PG&G) should reverse its decision to close the Diablo Canyon nuclear power plant. These two facilities represent the largest clean air assets in terms of environmental justice in California. Closing San Onofre and Diablo Canyon nuclear power plants are the two worst decisions in the history of the State of California when it comes to environmental justice. These plants are largely emission free and do not contribute smog forming gases or greenhouse gases in California. To the extent that vulnerable environmental justice communities are disproportionately impacted by pollution sources, as verified by the California Legislature, Governor’s Office and various state agencies, these closures represent a significant environmental injustice. It adds insult to injury that these plants are being closed prematurely due to questionable corporate and agency decision-making. On June 7, 2013, Southern California Edison (SCE) announced plans to permanently retire Units 2 and 3 at the San Onofre Nuclear Generating Station (SONGS). One June 12, 2013 the licensee submitted a Certification of Permanent Cessation of Power Operations to the NRC, certifying that SCE has permanently ceased power operations at SONGS Units 2 and 3. The state Public Utilities Commission recently announced that a 2014 agreement that apportioned financial responsibilities for the shutdown of SONGS would be reconsidered. The agreement was considered to be tainted because the it was preconceived by former California Public Utility Commission (CPUC) President Michael Peevey in an ex parte communication at a meeting with Southern California Edison in Warsaw, Poland. Unfortunately, SCE, which is regulated by the CPUC, worked covertly with the regulators to secretly negotiate a settlement that ultimately would transfer billions of dollars of costs from the utility to the public. Local utility customers are facing 70 percent of the nuclear plant’s $4.7 billion closure costs. The CPUC fined Edison $16.7 million in 2015 for secret communications related to the Settlement Agreement despite denials by SCE that violations occurred. The Settlement Agreement related to the SONGS closure should use any proceeds approved by the CPUC to gain approval for a new operating license for the facility and replacement of the faulty steam generators. The Settlement Agreement that emerged from negotiations by SCE, SDG&E, Office of Ratepayer Advocates (ORA), The Utility Reform Network (TURN), Friends of the Earth, and Coalition of California Utility Employees, was a flawed deal that proposed to compensate SCE for revenue losses due to the closure of SONGS. The Settlement Agreement assigns ratepayers $3.3 billion of the $4.7 billion shutdown costs. In some sort of mathematical jujitsu, it is reported that ratepayers will somehow ‘save’ $400 - $500 million off their share of the deal. This is not a good deal for ratepayers. It would still leave ratepayers on the hook for $3 billion. The flawed Mitsubishi steam generators cost $680 million and could easily be replaced if ratepayers are going to cough up billions of dollars for SONGS. Clearly, revenues should not be approved for losses due to the closure, but should be redirected to relicensing and operating the plant. The $4.7 billion should be redirected to replacing the faulty steam generators that led to the shutdown. That is more than enough to cover these expenses. Such a decision would represent a great achievement in terms of environmental justice because SONGS is the biggest clean air asset in the Los Angeles and San Diego basins. The old, challenged Settlement Agreement required that SCE customers would not pay for the failed steam generators provided by Mitsubishi that prompted the closure. SCE shareholders, and not ratepayers, would have paid for the faulty steam generators from the day they were no longer providing power. We support concessions to ratepayers, but such concessions should not replace the benefits that result from the operation of emissions free SONGS. Also, instead of shareholders only paying for nonfunctioning steam generators, they should be paying for functioning steam generators at a relicensed and operating plant. The regulators, corporations and listed stakeholders to the Settlement Agreement placed the health of utility ratepayers on the backburner in favor of other considerations, such are reliability, profits, anti-nuclear sentiment and expediency. This insults the Clean Air Act. It insults asthmatics and others suffering from cardiopulmonary diseases. Southern California is in nonattainment for ozone and particulate matter. No decisions should be made that add one more pound of these pollutants to the ground-level ambient air. Closing SONGS violates this Clean Air Act trust because replacement power will come from sources that produce these Environmental Protection Agency (EPA) recognized Criteria Pollutants. Retrofitting a nuclear plant with cooling towers is very risky and has never been attempted by any utility. Due to the important clean air benefits of these two facilities, they should be allowed to utilize wedge wire screens as best technology available. San Onofre's license expires in 2022. And San Onofre's operator, Southern California Edison, had not submitted a relicensing application to the Nuclear Regulatory Commission (NRC) at the time of the plant retirement announcement in June 2013. Pacific Gas & Electric (PG&E) announced in June 2016 that it would close Diablo Canyon Nuclear Power Plant (DCNPP) after its current U.S. Nuclear Regulatory Commission operating licenses expire in November 2024 and August 2025. The Diablo Canyon nuclear plant, built near Avila Beach in San Luis Obispo County, provides 2,160 megawatts of electricity for Central and Northern California — enough to power more than 1.7 million homes. According to PG&E, the power produced by Diablo Canyon’s two nuclear reactors would be replaced with investment in a greenhouse-gas-free portfolio of energy efficiency, renewables and energy storage. It is not currently possible to replace this massive source of baseload electricity with efficiency, renewables and energy storage. Nor will it be possible in the foreseeable future. Fortunately, the proposal is contingent on a number of regulatory actions, including approvals from the California Public Utilities Commission. The proposal claims the nuclear energy will be replaced completely with gains in efficiency and renewables. But the proposal’s details do not back this up. In fact, it calls for implementing renewables and efficiency equal to only about a quarter of Diablo Canyon’s generation. Instead, experts agree, the generation will mainly be replaced by natural gas, and attempts to buy energy from out-of-state. The California proposal also claims that there will be no increased cost to ratepayers, which is kind of true but a bit disingenuous since it neglects to mention that the production and installation costs for the renewables will be put on the backs of taxpayers, federal and California, who will not even be aware of the additional costs. Renewables make money only because of the Production Tax Credit (which covers almost all production costs) and the Investment Tax Credit (which covers about a third of the construction costs), plus State incentives that apply only to renewables. Thus, Diablo Canyon’s 18 billion kWhs per year, the largest and lowest-carbon electricity generation in California, will be replaced by less than 2 billion kWhs per year of similarly-low-carbon renewables, less than 2 billion kWhs per year from efficiency, and over 10 billion kWhs per year from high-carbon natural gas and costly out-of-state purchases, which California hopes to get from our hydroelectric dams up here in the Pacific Northwest. Banking on hydro in a state with historic drought is quite a gamble. One thing that nuclear power has proven over the past few decades is that it is safe and dependable. Diablo Canyon Nuclear Power Station is located in San Luis Obispo County. The county has many different sources of air pollution, ranging from large power plants to small household emissions. By far the largest contributor of air pollution in the county is motor vehicles. The pie chart below shows emission sources of reactive organic gases (ROG) and oxides of nitrogen (NOx), the main precursors for ozone formation, in San Luis Obispo County. Diablo Canyon's unit licenses expire separately in 2024 and 2025. Pacific Gas and Electric Co., operator of the Diablo Canyon plant, filed a renewal application in 2009, then placed it on hold to resolve the issues surrounding offshore seismic testing. The federal Clean Air Act requires areas that exceed the health-based national ambient air quality standards to develop State Implementation Plans (SIP) that demonstrate how they will attain the standards by specified dates. In 2008, the United States Environmental Protection Agency (U.S. EPA) strengthened the 8-hour ozone standard to 75 parts per billion (ppb). Sixteen areas in California were designated nonattainment in 2012. In 2012, U.S. EPA also strengthened the annual fine particulate matter (PM2.5) standard to 12 micrograms per cubic meter (µg/m3). U.S. EPA designated four areas in California as nonattainment for this standard. ARB will be considering SIPs for both of these standards in 2016. Statewide, about 12 million Californians [out of 39 million] live in communities that exceed the federal ozone and PM2.5 standards. Two areas of the State have the most critical air quality challenges – the South Coast and the San Joaquin Valley. These regions are the only two areas in the nation with an Extreme classification for the federal ozone standard. The health and economic impacts of exposure to elevated levels of ozone and PM2.5 in California are considerable; meeting the standards will pay substantial dividends in terms of reducing costs associated with emergency room visits and hospitalization, lost work and school days, and most critically, premature mortality. Although most smog in nonattainment areas in California is created by mobile sources, stationary sources of air pollution are still important. According to the ARB, “Mobile sources – cars, trucks, and myriad off-road equipment – and the fossil fuels that power them are the largest contributors to the formation of ozone, PM2.5, diesel particulate matter, and greenhouse gas emissions in California.” According to the State of California Department of Motor Vehicles, there were 34,346,325 total registered vehicles in California through 2015. Accordingly, the ARB puts most of its emphasis on reducing mobile sources of air pollution. ·Mobile sources - all on-road vehicles such as automobiles and trucks; off-road vehicles such as trains, ships, aircraft; and farm equipment. California is divided geographically into air basins for the purpose of managing the air resources of the State on a regional basis. The State is currently divided into 15 air basins. The names of the basins are listed below on the state ARB map below. A new study conducted by the American Thoracic Society concludes that about 1,341 people are estimated to die each year because of bad air in the Los Angeles-Long Beach-Glendale area. That makes the L.A. area’s air quality the deadliest in the nation. The study was based on air pollution data for both fine particle and ozone levels in U.S. metropolitan areas recorded in 2011, 2012 and 2013. According to a California Air Resources Board Assessment of PM Health Effects, statewide annual statistics include: 5,400 premature deaths, 2,400 hospitalizations, 140,000 asthma and lower respiratory symptoms, 980,000 lost work days, and 5,000,000 minor restricted activity days. Exposure to levels of ozone above the current ambient air quality standard can lead to human health effects such as lung inflammation and tissue damage and impaired lung functioning. Ozone exposure is also associated with symptoms such as coughing, chest tightness, shortness of breath, and the worsening of asthma symptoms. The best protection from ozone is to not be exposed to it. Remaining inside under air conditioning during nonattainment days is one simple solution to avoiding the negative effects of ozone. Extensive research indicates that exposure to outdoor PM 10 and PM 2.5 levels exceeding current air quality standards is associated with increased risk of hospitalization for lung and heart-related respiratory illness, including emergency room visits for asthma. PM exposure is also associated with increased risk of premature deaths, especially in the elderly and people with pre-existing cardiopulmonary disease. In children, studies have shown associations between PM exposure and reduced lung function and increased respiratory symptoms and illnesses. Again, the best protection from particular matter is to remain inside during nonattainment days. Unfortunately, the best method for avoiding the negative health effects of NO2 is to remain inside to avoid inhaling the pollutant. Polluted air also damages agriculture, the natural environment, and human-made materials. Improving air quality enhances public health and produces economic benefits that more than offset the costs of attaining clean air. Not only is the health of residents in the San Joaquin Valley seriously threatened by smog, the crops that are the lifeblood of the area are also negatively impacted by air pollution. As one of the six primary air pollutants regulated under the Clean Air Act and enforced by EPA through the states, nitrogen dioxide control is extremely important to vulnerable communities that are already burdened with a disproportionate amount of pollution compared to other communities. Nitrogen Dioxide (NO2) is one of a group of highly reactive gases known as oxides of nitrogen or nitrogen oxides (NOx). NO2 primarily gets in the air from the burning of fuel. NO2 forms from emissions from cars, trucks and buses, power plants, and off-road equipment. Breathing air with a high concentration of NO2 can irritate airways in the human respiratory system. Such exposures over short periods can aggravate respiratory diseases, particularly asthma, leading to respiratory symptoms (such as coughing, wheezing or difficulty breathing), hospital admissions and visits to emergency rooms. Longer exposures to elevated concentrations of NO2 may contribute to the development of asthma and potentially increase susceptibility to respiratory infections. People with asthma, as well as children and the elderly are generally at greater risk for the health effects of NO2. NO2 along with other NOx reacts with other chemicals in the air to form both particulate matter and ozone. Both of these are also harmful when inhaled due to effects on the respiratory system. Unlike the rest of the country, electricity generation and other stationary sources of emissions, such as industrial activity and residential heating, make up a smaller share of NOx emissions in California. Within the mobile source category, diesel and gasoline-powered vehicles and equipment make up much of the sources of NOx emissions. Fortunately, the vast majority of California has been successful in gaining attainment status for NO2. In order to achieve attainment for ozone and PM2.5, it will take a massive effort of mobile and stationary source changes. Most of California is in attainment for Nitrogen Dioxide (See illustration below). Ground level or "bad" ozone is not emitted directly into the air, but is created by chemical reactions between oxides of nitrogen (NOx) and volatile organic compounds (VOC) in the presence of sunlight. Emissions from industrial facilities and electric utilities, motor vehicle exhaust, gasoline vapors, and chemical solvents are some of the major sources of NOx and VOC. Breathing ozone can trigger a variety of health problems, particularly for children, the elderly, and people of all ages who have lung diseases such as asthma. Ground level ozone can also have harmful effects on sensitive vegetation and ecosystems. Most of California is in nonattainment for Ozone (See illustration below). These maps are updated annually for the State area designations. The Board makes State area designations for ten criteria pollutants. PM stands for particulate matter: the term for a mixture of solid particles and liquid droplets found in the air. Some particles, such as dust, dirt, soot, or smoke, are large or dark enough to be seen with the naked eye. Others are so small they can only be detected using an electron microscope. · PM2.5 : fine inhalable particles, with diameters that are generally 2.5 micrometers and smaller. These particles come in many sizes and shapes and can be made up of hundreds of different chemicals. Particles less than 10 micrometers in diameter pose the greatest problems, because they can get deep into your lungs, and some may even get into your bloodstream. Some are emitted directly from a source, such as construction sites, unpaved roads, fields, smokestacks or fires. Most particles form in the atmosphere as a result of complex reactions of chemicals such as sulfur dioxide and nitrogen oxides, which are pollutants emitted from power plants, industries and automobiles. Significant portions of California are in nonattainment for PM 2.5 (See Figure 6). Clearly, area wide sources of air pollution are a primary source of concern for PM2.5 production. Stationary (including power plants) and mobile sources are also areas of concern. However, powering plug-in electric vehicles with fossil fuel sources of electricity production will prevent the very clean air benefits the state is seeking. Renewables cannot provide the baseload power because they are intermittent sources of electricity. Nuclear power is the best emission free source of baseload power. Global warming ‘cooks’ up a more dangerous smog in nonattainment areas. That is why EPA now regulates climate change gases. EPA’s ‘Endangerment Finding’ covers emissions of six key greenhouse gases: carbon dioxide, methane, nitrous oxide, hydrofluorocarbons, perfluorocarbons and sulfur hexafluoride. On June 23, 2014, the U.S. Supreme Court upheld the EPA’s authority to limit carbon pollution. In Utility Air Regulatory Group v. EPA, the U.S. Supreme Court found 5-4 that EPA cannot regulate a power plant solely due to its GHG emissions, striking down the Tailoring Rule. However, a separate 7-2 ruling found that EPA has the authority under the Clean Air Act to regulate GHG emissions from new power plants, provided the source is regulated for other air pollutants. The new gas-fired generation in Southern California was built within 40 to 80 miles of SONGS and was online as of August 2013. This new generation is the primary reason that Southern California reserve margins increased from 2012 to 2013 despite the loss of SONGS. The current low price of natural gas is also allowing natural gas-fired generators to compete with nuclear plants on price. permits even as they continuously violate the Clean Air Act. Utilizing natural gas plants to replace SONGS and Diablo Canyon will significantly increase NOx emissions in California. Nationally, electric power plant boilers produce about 40% of the NOx emissions from stationary sources. Automobiles and other mobile sources contribute about half of the NOx that is emitted. A major environmental justice area is California’s Central Valley. Of the 375 U.S. cities included in a World Health Organization report that looks at the concentration of particles measuring 10 micrometers or less – those likely to get into the blood stream and cause disease, only 36 of them exceed the WHO’s air quality standard of 20 micrograms of particulates per cubic meter, on average. Of the ten worst performing cities, five are located in California’s Central Valley. The Central Valley, anchored by Fresno, Bakersfield, and Modesto, is the farming center of the state and the country. Its eight counties grow about half of the nation’s fruits and vegetables. This fact is largely due to its wide valley that also causes persistent problems with air pollution. The Valley is also one of the most polluted regions in the state and country. The Valley does not currently meet health-based standards set by the United States Environmental Protection Agency for ozone and particulate matter. On average the Valley exceeds the federal health-based standards for ground-level ozone 35-40 days and more than 100 days over the state ozone standard. While levels of airborne particles exceed the federal standard less than five times annually, because the California standard is set at a lower and more protective level, the Valley exceeds this limit an average of 90-100 days per year. The San Joaquin Valley Air Basin is approximately 250 miles long and is shaped like a narrow bowl. The bowl-shaped Valley collects and holds emissions caused by the activities of the Valley's 3 million residents and their 2 million vehicles, as well as vehicles from other areas traveling on Highway 99 and Interstate 5. Farming and industry activity also play a large role in the emission of particulates and ozone in the Valley. Air pollution transported from the San Francisco Bay and Sacramento areas account for approximately 27 percent of the total emissions in the Northern portion of the District (San Joaquin, Stanislaus, and Merced Counties). In the Central region (Fresno, Madera and Kings Counties), the percentage drops to 11 percent, and in the South Valley (the Valley portion of Kern and Tulare Counties), transported air pollution accounts for only 7 percent of the total problem. Currently, the Valley is federally classified as Severe non-attainment for the federal ground-level ozone and particulate matter less than 10 microns in diameter (PM10) standard. The Valley is classified as Severe non-attainment for the California ozone standard and non-attainment for the state's PM10 standard. The Valley is designated as being in attainment for all other criteria pollutants. The map below shows the important position of the Valley in California. It is right in the heart of the state. Yet, it is one of the most polluted air sites in the world. How the CPUC can sign off on closing any emission free nuclear power plant is baffling. Such closure decisions ignore the health of most of the citizens of California. The CPUC and the ARB need to get together to make decisions that enhance the health of Californians instead of making decisions to hurt them. In addition to the San Joaquin Valley’s Severe non-attainment designation for ozone and PM2.5, Southern California also suffers from the same criteria pollutants. The health and air quality impacts of pollution from agriculture in the San Joaquin Valley are tremendous. Every county in the Valley received a grade of “F” for air pollution from a recent American Lung Association report, due to the high number of dangerous smog days. . . . The childhood asthma levels in the Valley are disproportionately high, at triple the national average and the highest regional rate in California. Nearly 12,000 people in the SJ Valley are hospitalized annually for air pollution-related illness. The closure of Diablo Canyon Nuclear Power Station, a significant, emission free source of electricity production, will represent a significant environmental injustice to the residents and workers in the San Joaquin Valley. Mobile sources are the primary sources of air pollution in California. This report will not go into the voluminous content in this air pollution issue area, but will provide some succinct perspectives on the issue. We recommend a combination of nuclear power combined with hydrogen fuel cell electric vehicles as a front-line strategy to mitigating smog. However, due to market conditions, it will probably be some time before this strategy can be effective unless there is a crash program to apply this approach. Diablo Canyon and SONGS are central to such a strategy. It would also require the construction of more nuclear power plants in California. California already leads the nation in hydrogen fuel cell electric vehicle use. Despite many decades of increasingly tight and wide-ranging regulations, emissions from mobile sources are still a major source of air pollution in the United States and California. There are precise regulations for onroad and nonroad vehicle sources. There are regulations for new vehicles and motors. There are emission standards for light-duty vehicles, light duty trucks and heavy-duty trucks. There are technology innovations and emissions controls. Catalytic converters would be at the top of the list in terms of mitigating NOx and other emissions. The contents of gasoline and diesel fuel are regulated. There are behavioral and societal strategies to reduce mobile-source emissions. High Occupancy Vehicle (HOV) lanes are an example of this approach. There are controls on infrastructure planning and investment. Finally, there are promotions for new technologies using vehicle emission standards. Whether the state engages in emissions trading programs or other emissions reductions programs, it is difficult to quantify such reductions. Mobile source emissions depend upon the following: number of hot and cold engine starts, vehicle miles traveled, number of engine cooldowns, diurnal evaporation, running evaporation, and fueling losses. The magnitude of the emissions associated with each of the above emission components are affected by: vehicle age, temperature, vehicle speed, congestion delay, operating environment, etc. Quantifying emission reductions resulting from a mobile source control strategy is very difficult. In addition, emission reductions per vehicle are relatively small, resulting in a system that requires the quantification of emissions from numerous mobile sources in order to provide even minor emission reductions for use at a stationary source. According to the ARB, stationary sources are large, fixed sources of air pollution and include power plants, refineries, and factories. Qualifying stationary sources have to get construction and operating permits. Beginning in the early 1970s, California districts already had required permits for both the construction and operational phase of any non-exempt new or modified emissions unit. A federal operating permit program was not authorized until the addition of Title V in the 1990 federal Clean Air Act Amendments. Following the implementation of Title V, there are new federal operating permit requirements enacted at the district level. Now major sources and, in some cases minor sources, need Title V operating permits. Sanctions are intended to induce States to develop strategies to attain the air quality standards. There are two sanctions…1) The offset sanction is related to the fact that owners of new or expanded stationary sources of a pollutant for which an area is in nonattainment must "offset" their increased emissions by reducing existing emissions by at least the amount of the increase. This requirement is related to air quality since it prevents economic development from increasing emissions in areas that are already violating the air quality standards. 2) The highway sanction is a prohibition on Federal funds for transportation projects within an area. This report describes how electricity reserve margins were increased via construction of new and repowered power plants. These margins were largely achieved through the construction of natural gas-fired combined cycle generation, thus increasing NOx. Yet emission free SONGS generation was replaced with this natural gas generation. Reopening SONGS could actually serve as an offset to this reserve generation that was brought online. The South Coast Air Quality Management District (SCAQMD) is one of the 35 air quality regulatory agencies in California. Each of these agencies was created with the sole purpose of controlling air pollution within its jurisdictional boundaries. The SCAQMD regulates air quality in the South Coast Air Basin (SCAB) through programs and initiatives that include the use of permits and compliance checks for more than 28,000 businesses that range in size from corner gas stations to large petroleum refineries. Because the SCAB experiences some of the worst air pollution in the nation, the SCAQMD is often at the forefront of the nation’s regulatory efforts in air quality. At the same time, severe fines are imposed for non-compliance (up to $1 million per day, depending on the severity of the problem). Most of “Southern California” falls into a 10,000-square-mile area called the South Coast Air Basin (SCAB). Geographically, the SCAB includes all of Orange County and the urban parts of Los Angeles, Riverside, and San Bernardino counties. There are three primary reasons why the SCAB experiences some of the worst air quality in the nation: 1) Population: With nearly 17 million people, the SCAB is the second most populated urban area in the U.S. 2) Sunshine: The SCAB experiences the most days of sunlight out of all major urban areas within the U.S. (with the exception of Phoenix). While people flock to the sunshine, it is also the same sunshine that causes the formation of air pollutants in the atmosphere. 3) Ports: The SCAB is home to two of the busiest ports in the U.S. — Los Angeles and Long Beach. The state has built a tremendous amount of new natural gas-fired capacity over the last decade, both combined cycle plants and simple cycle peaker plants (aka “combustion turbines”). These units were justified on the presumption of steadily rising electricity consumption and peak load. The projected peak load increases have not materialized. In the meantime most of the older steam boiler plants along the California coast remain operational. The result is thousands of MW of available resources beyond the level of reserves necessary to assure grid reliability in California. The state’s planning reserve margin requirement, meaning the quantity of spare supply available to meet peak demand, is 15 to 17 percent. The planning reserve margin forecast by CAISO for Southern California in 2012 was approximately 30 percent. The 31 percent planning reserve margin for Southern California in 2013 was essentially unchanged from 2012, despite the loss of SONGS, due to the addition of nearly 2,000 MW of new gas-fired plants in the Los Angeles Basin. This 31 percent planning reserve margin equates to approximately 4,300 MW of excess capacity beyond what is needed to meet the 15 percent minimum reserve margin requirement. The closures of SONGS and Diablo Canyon would erase the 31 percent reserve margin and the addition of nearly 2,000 MW of new gas-fired plants in the Los Angeles Basin will be used to maintain a 15 percent minimum reserve margin. The environmental injustice is that this NOx –based approach is being used to maintain these margins in the face of closing emission free nuclear power. It appears that state regulators are purposefully violating environmental justice statutes and guidance by engaging in the questionable closures of two primary stationary source clean air assets. Why would they knowingly violate the many principles of environmental justice established by the State of California in the past decade? We can only conclude that they do not really care about environmental justice but simply give it paper lip service in order to silence environmental justice groups and activists. Moreover, none of the environmental justice statutes, regulations and guidances have any teeth for stopping projects or for protecting environmental justice assets. A relatively new justification for adding potentially 1000s of MW of new fast response “flexible” gas-fired generation in California over the next several years is integration of large amounts of wind and solar resources while maintaining grid reliability. Again, how can any of this generation be justified in Clean Air Act nonattainment areas? How can this new generation be justified in light of the many environmental justice measures approved by the state? Clearly the state is putting electricity reliability based on ozone, NOx and PM emissions above its Clean Air Act and environmental justice responsibilities. When the state encourages closure of two nuclear power plants, which do not contribute to smog formation and enhance environmental justice, to close, they are in essence promoting environmental injustice. They are also violating the spirit of the Clean Air Act. To the extent wind power is predicated upon natural gas backup, it too represents an environmental injustice in a nonattainment area. New sources of NOx and PM should be banned until an area is brought into attainment. Unfortunately, the SIP is utilized as a crutch because as long as its ‘plan’ projects attainment, new building permits and highway funds can be released. This renders the Clean Air Act useless in mitigating air pollution-oriented environmental injustice in California. When it comes to clean air, nuclear power plants are the single biggest asset in the regions where they are operated. Nuclear power plants translate into an environmental justice benefit for vulnerable communities because they mitigate serious air pollution problems and negative health effects such as asthma and other cardiopulmonary illnesses. All people in Clean Air Act nonattainment areas are disproportionately impacted by smog. This in no way detracts from micro communities that are clearly impacted by a disproportionate number of pollution sites in addition to the regular smog impacts. It is within this context that EHJ cites nuclear power plants as clean air assets in nonattainment areas. In fact, to the extent environmental justice groups and activists identify disproportionately impacted minority communities as being ‘more’ impacted, nuclear power plants would serve to help them more. California state law defines environmental justice as the fair treatment of people of all races, cultures, and incomes with respect to the development, adoption, implementation, and enforcement of environmental laws, regulations, and policies (California Government Code sec.65040.12). In 1997, AQMD implemented 10 environmental justice initiatives designed to protect district residents’ right to live and work in an environment of clean air, free of airborne health threats. AQMD’s environmental justice program was expanded in 2002 to include 23 enhancements that serve as the basis for further outreach and problem-solving activities regarding environmental justice issues. Prior to being adopted by the AQMD Governing Board, environmental justice work plans are reviewed by the Ethnic Community Advisory Group, an ethnically-diverse committee of residents and business people. In this report, we are expanding the definition of ‘environmental justice community’ to include any community in a nonattainment area. These communities are disproportionately impacted by air pollution as designated by the U.S. Congress and the U.S. Environmental Protection Agency. An additional caveat is that shuttering 4,000 megawatts of emission free power from Diablo Canyon and SONGS and replacing it with natural gas-powered plants will increase smog formation in California. We make this distinction because of the unique emission free nature of nuclear power plants and justify the difference in definition due to state efforts to violate Clean Air Act State Implementation Plans by assisting in the closure of these facilities. The CPUC violates the spirit of the Clean Air Act when it encourages the use of fossil fuel generation to replace emission free electricity generation. That primary environmental justice communities in California based on smog are the San Joaquin Valley and the South Coast. These two areas have the most severe smog in the nation. CalEnviroScreen is a mapping tool that helps identify California communities that are most affected by many sources of pollution, and where people are often especially vulnerable to pollution’s effects. CalEnviroScreen uses environmental, health, and socioeconomic information to produce scores for every census tract in the state. The scores are mapped so that different communities can be compared. An area with a high score is one that experiences a much higher pollution burden than areas with low scores. CalEnviroScreen ranks communities based on data that are available from state and federal government sources. CalEnviroScreen 2.0 uses a suite of 19 indicators to characterize pollution burden (12 indicators) and population characteristics (7 indicators). Each indicator is assigned a score for each census tract in the state based on the most up-to-date suitable data. Scores are weighted and added together within the two groups to derive a pollution burden score and a population characteristics score. Those scores are multiplied to give the final CalEnviroScreen score. SB 535 states that disadvantaged communities “shall be identified based on geographic, socioeconomic, public health, and environmental hazard criteria. “ The indicators comprising the CalEnviroScreen model include some of each type of criterion. The CalEnvironScreen 3.0 (see Screen and Indicators below) shows the L.A. Basin and the San Diego Basin to be very high environmental justice pollution areas. Replacement power for San Onofre Nuclear Generating Station comes from plants in the L.A. and San Diego load pockets. These load pockets are in nonattainment areas. If Diablo Canyon nuclear plant closes, replacement power will come from fossil plants that will add NOx to a region that is in attainment for this criteria pollutant, but could ultimately be pushed back into nonattainment due to the plant closure. As the chart above shows, the CalEnviron 3.0 includes three primary indicator types: 1) Pollution Indicators, 2) Environmental Effect Indicators, and 3) Population Characteristics Indicators. Included under Pollution Indicators are seven Exposure Indicators: 1) Air Quality: Ozone, 2) Air Quality: PM2.5, 3) Diesel Particulate Matter, 4) Drinking Water Containments, 5) Pesticide Use, 6) Toxic Releases from Facilities, and 7) Traffic Density. Included under Environmental Effect Indicators are five (5) items: 1) Cleanup, 2) Groundwater Threats, 3) Hazardous Waste Generators and Facilities, 4) Impaired Water Bodies, and 5) Solid Waste Sites and Facilities. The Population Characteristics Indicators category includes three Sensitive Population Indicators: 1) Asthma, 2) Cardiovascular disease, and 3) Low Birth Weight Infants. Socioeconomic Factor Indicators include four categories: 1) Educational Attainment, 2) Linguistic Isolation, 3) Poverty, and 4) Rent-adjusted Income. EHJ, in expanding the definition of environmental justice as it relates to nuclear power plants, is expanding the environmental justice pollution areas to include all communities in California that are in nonattainment for any criteria pollutant. Moreover, EHJ’s criterion for clean air nonattainment is higher than EPA’s. EHJ’s criterion is if you can see the air, it is not healthy to breathe. The EHJ criterion would have many more nonattainment days than the EPA criteria. Smog in Beverly Hills triggers asthma attacks just as they do in Compton. The point is that eliminating 4,000 megawatts of emission free electricity generation and replacing it with natural gas will produce more smog in the L.A. and San Diego Basins and in the San Joaquin Valley. The bill would also require the environmental justice element, or related environmental justice goals, policies, and objectives integrated in other elements, to identify objectives and policies to reduce the unique or compounded health risks in disadvantaged communities, as specified, identify objectives and policies to promote civil engagement in the public decision making process, and identify objectives and policies that prioritize improvements and programs that address the needs of disadvantaged communities. A recommendation to keep these valuable plants open from the appropriate agencies and community groups would be very helpful in maintaining the operation of these important environmental justice assets. Environmental justice groups should support nuclear power due to its emission free nature. Environmental justice groups in California should support reopening SONGS and should support continued operation of Diablo Canyon nuclear power plant. These plants do not release smog forming and greenhouse gases and they replace emissions from fossil fuel-fired power plants. The California Environmental Justice Alliance (CEJA) and the California Environmental Justice Coalition should support the continued operation of SONGS and Diablo Canyon nuclear power plant as a top environmental justice priority. The Environmental Justice Coalition for Water should support these nuclear power plants. Other organizations that should support nuclear power in California include: Environmental Health Coalition, Central California Environmental Justice Network, Center for Community Action and Environmental Justice, Communities for A Better Environment, Greenaction for Health and Environmental Justice, East Yard Communities for Environmental Justice, EJ Matters for Climate Change, Bay Area Environmental Justice Collaborative, Literacy for Environmental Justice, West County Toxics Coalition, California Environmental Rights Alliance, UC Davis, Environmental Justice Project, Center on Race, Poverty and the Environment, and Mothers of East LA. Other organizations, agencies and activists are also encouraged to support the continued operation of these nuclear power plants. No More Fossil Fuels: In order to address global warming and climate change seriously, we need to transition away from fossil-fuel energy. We need to reduce energy consumption, and switch to efficiency and clean renewable energy sources. We must implement the state’s energy loading order and stop approving new gas-fired power plants. How can CEJA, which bemoans industrial sites in minority neighborhoods, ignore the emission free benefits of California’s nuclear plants? Moreover, these plants are not located in minority neighborhoods. Thus, their opposition to nuclear power is illogical. Both peak loads and annual electricity consumption have been fluctuating for the last eight years with a flat trend. The lack of peak demand growth experienced in California over the last eight years is not an anomaly. Utility companies throughout the U.S. are experiencing flat and declining demand. Customer attitudes toward electricity consumption, more rigorous building and appliance efficiency standards, larger state and federal expenditures for energy efficiency and the growth of rooftop solar are factors in what appears to be a fundamental change in electricity consumption and economic trends. These are the two primary reasons, large new capacity additions and lower loads, that the planning reserve margin for the summer of 2013, without SONGS and assuming below average hydroelectric production, was approximately 30 percent. Summer 2013 reserves were at least double the planning reserve margin requirement of 15 to 17 percent. CAISO forecasts “healthy reserves” in Northern and Southern California, 38.8 percent and 31 percent respectively, in the summer of 2013. These planning reserve margins translate into approximately 5,000 MW of reserves above the minimum requirement in Northern California, and 4,300 MW of reserves above the minimum requirement in Southern California. The Southern California reserve margin was calculated by CAISO assuming that SONGS will not be available. When the economy picks up, these reserve margins will be reduced. Regardless, these natural gas units being used to replace SONGS emit additional NOx and PM and the resulting ozone that would not have been produced if SONGS was still operating. June 1, 2013. The two off-line SONGS units, in comparison, total 2,246 MW and 2,160 MW from Diablo Canyon. Southern California Edison is bolstering strategic grid locations in the Los Angeles basin and northern San Diego County. SCE will reconfigure the existing 220-kilovolt Barre-Ellis transmission line from two circuits to four. The region also needs local sources of reactive power (a portion of generated electricity which is lost in large quantities when transmitting power over long distances, i.e. importing power from some of the new generating capacity to Southern California). Source: U.S. Energy Information Administration, based on the California Independent System Operator's 2013 Summer Loads and Resources Assessment. Capacitors are being added to several substations (see map above), and two natural gas-fired generators at the Huntington Beach facility will be converted to synchronous condensers. Capacitors and synchronous condensers are commonly used to provide voltage support in the form of reactive power to the transmission grid. All of these system upgrades are designed to allow the system to bring more power into the region. Replacing the power from a low-cost source of generation like SONGS already has changed wholesale electricity prices in the state. Rising natural gas prices are likely to increase. In addition, the unusually large spread in wholesale electricity prices between the northern and southern portions of the state indicates system congestion. California electricity generating power plants have faced a challenge in meeting cooling water regulations that require them to build cooling towers or otherwise reduce marine organism mortality. It was and is a huge challenge for the two largest water using plants in the state, San Onofre and Diablo Canyon. Their conformity dates are 2022 and 2024, respectively. No nuclear power plant in the world has been retrofitted with cooling towers. These plants could use wedge wire screen technology as best available technology. State administrations that are opposed to nuclear power use this provision as a ‘backdoor’ way to shut down the plants. Nuclear power plant owners are not going to engage in such a risky and experimental retrofit. The Clean Water Act requires the U.S. Environmental Protection Agency to ensure that the location, design, construction, and capacity of cooling water intake structures reflect the best technology available for minimizing adverse environmental impacts. The State Water Resources Control Board (SWRCB) first described a California regulatory approach in March 2008. The California Independent System Operator (California ISO), California Energy Commission (Energy Commission), and California Public Utilities Commission (CPUC) worked closely with the SWRCB to develop a policy to achieve water quality goals while ensuring electricity grid reliability. On May 4, 2010, the SWRCB approved a once-through-cooling (OTC) policy that included many grid reliability recommendations made by the California ISO, as well as a joint implementation proposal developed by the Energy Commission, CPUC, and California ISO. The Office of Administrative Law approved the policy on September 27, 2010, and the policy became an effective regulation on October 1, 2010. The regulation affected 19 California power plants (See Attachment 2). Of those, 16 power plants totaling about 17,500 megawatts (MW) are in the California ISO balancing authority area, and 3 are in the Los Angeles Department of Water & Power (LADWP) balancing area. The variable operating cost of electric power generators is a key factor in determining which units a power system operates (or "dispatches") to meet the demand for electricity. Other things being equal, plants with the lowest variable operating costs are generally dispatched first, and plants with higher variable operating costs are brought on line sequentially as electricity demand increases. This sequence can be seen in an electricity supply curve—also referred to as a dispatch curve—that represents the order in which units are dispatched to meet the demand. Peaking generators typically have the highest variable operating costs and are dispatched during the hours when demand for electricity is highest. Additional research is needed to examine how and if these economic dispatch decisions have environmental justice implications. Such an analysis exceeds the goals of this report. However, with reserve margins being composed mostly of new gas units, the closures of SONGS and DCNPP will definitely complicate this issue. There are a large number of electricity power plants in California. This report takes a sample of those plants to illustrate how the closure of SONGS will lead to additional NOx, Ozone and PM2.5 emissions in the Southern California Clean Air Act nonattainment areas. There are also proposals to build additional natural gas fired generation between Oxnard and San Diego (See Attachment 1). All of these are large plants with capacities ranging from approximately 500 MW to 2,000 MW. El Segundo Power submitted to the California Energy Commission a petition to amend their permit for CEC’s previously approved El Segundo Power Redevelopment Project (Docket Number 00-AFC-14C), which allowed for the replacement of Units 1 and 2 with a 630-megawatt combined-cycle power facility. The petition requested modifications to the plant’s design to utilize Rapid Response Combined Cycle technology (which includes air cooling as opposed to once-through ocean water cooling) and method of delivery of over-sized equipment to include delivery by barge over El Segundo Beach. In August 2013 NRG Energy Inc.’s 550-megawatt El Segundo natural gas-fired power plant near Los Angeles entered service. The combined-cycle plant can generate enough power to supply about 450,000 homes. NRG Energy sells power from the plant to SCE through a 10-year purchase agreement. The new plant can deliver more than half of its generating capacity in less than 10 minutes and the balance in less than 1 hour, which is needed as California relies more on intermittent renewable technologies like wind and solar that depend on weather conditions. NRG Energy built the new El Segundo plant at the site of a retired gas-fired steam unit constructed in 1964 that relied on ocean water for cooling. The new plant relies on reclaimed water for its air-cooled operation, reducing the use of potable water at the site by nearly 90 percent. The El Segundo Power Plant Redevelopment Project includes the removal and replacement of two existing electric generation units (Units 1 and 2), located on the north end of the facility. Three new Units (Units 5, 6, and 7) will be built in the area where Units 1 and 2 are being demolished. The new generation units are expected to generate 630 megawatts under normal operating conditions, which is 280MW more than the existing Units 1 and 2. The other two existing units (Units 3 and 4) located in the middle of the Generating Station will not be modified by this project. The Morro Bay power plant closed in 2014. The 650-megawatt plant has three 450 foot tall smoke stacks and is owned by Houston-based Dynegy. Continued operation would have required expensive upgrades by 2015 to comply with new state environmental laws to eliminate or drastically reduce the amount of seawater used for cooling. At a merchant power plant like Morro Bay, electric production is determined by market conditions. Dynegy decided to close the site because it was no longer economically viable and had been only been operating at about 5 percent of the power it’s capable of producing in recent years. . Over the past decade, the plant typically has only run during peak periods of energy consumption — such as hot summer days. The Encina power plant was retired to make room for a new facility. The approval of the new power plant on the old site has been attributed to the closure of SONGS. In January 2013, the San Onofre nuclear power plant went offline. Owners of the nuclear plant, Edison, announced in June 2013 that it would be permanently shut down because of structural issues. NRG was originally approved by the California Energy Commission in May 2012 to build the peaker style plants. Even though City of Carlsbad officials opposed the project, the closure of San Onofre meant a need for power locally so NRG worked with the city to come to an agreement. On July 30, 2015, the California Energy Commission approved a new natural gas-fired peaker plant in Carlsbad that would result in the old power plant being torn down and land along Carlsbad Boulevard freed up for uses more appropriate for the coast. This project is the result of an agreement approved by NRG, SDG&E and the City of Carlsbad in January 2014. The California Public Utilities Commission approved the new Carlsbad facility in a 4-1 vote. The $2.2 billion 500-megawatt deal for the new plant is designed to shore up electricity supplies after the early retirement of the San Onofre nuclear plant in June 2013. San Diego Gas & Electric negotiated directly with Princeton, N.J.-based NRG Energy to buy power from the proposed plant. If all challenges are overcome, the plant is expected to begin generating electricity in 2017. NRG’s 720-MW Generating Station, on the Sacramento–San Joaquin River Delta is a four-unit simple cycle plant that entered commercial operation in 2013, replacing the 1950s-era Contra Costa Power Plant on the same site. That two-unit steam plant was shut down in part because of its reliance on once-through cooling. The new plant requires only a tiny fraction of the old plant’s water consumption while generating more electricity. The plant supplies all its power to Pacific Gas & Electric under a 10-year power purchase agreement. The fast-start facility was specifically designed to compensate for the large amount of wind generation in the area, much of it from nearby Altamont Pass. Siemens supplied the four SGT6-5000F gas turbines, four SGen-1000A generators. During commissioning, all four F-Class turbines demonstrated the ability to ramp up to full load in 12 minutes. The turbines incorporate ultra-low NOx combustors and a selective catalytic reduction (SCR) system to control NOx emissions. 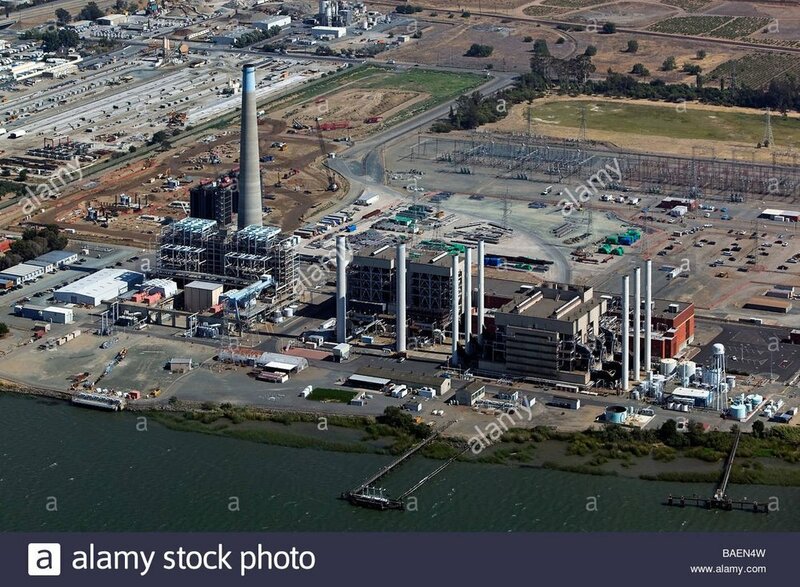 Pittsburg Power Plant (PPP) is a natural gas-fired steam electric generating facility located in an unincorporated section of the city of Pittsburg, Contra Costa County, owned and operated by Mirant Delta, LLC. The facility site is in the Sacramento/San Joaquin Delta on the southern bank of Suisun Bay near New York Point. PPP currently operates three steam-generating units (Units 5, 6, and 7), although only Units 5 and 6 use once-through cooling systems. Unit 7 is cooled by a closed-cycle system consisting of two crossflow wet cooling towers and a cooling canal. Units 1–4 have been retired from service. NRG Energy, the company that owns the West Pittsburg electric plant, plans to convert its fuel source from coal to natural gas. NRG Energy reversed its plans to cancel deactivation of the power plant in April 2015, and instead would generate electricity as a “peaker” plant by piping in gas instead of burning coal. A “peaker” plant supplies extra power to the grid on days of peak power demands. NRG Energy, based in Princeton, N.J., with dual headquarters in Houston, merged with the Houston-based GenOn Energy Inc. GenPittsburg Power Plant (photo courtesy Alamy)On had announced plans a year ago to shut down the West Pittsburg plant in 2016 because it would not comply with upcoming environmental regulations. Instead, NRG energy is proceeding with its gas addition project. The plans involve contracting with a company to build a pipeline to the plant. The plant’s capability now is 330 megawatts. Dynegy owns the Moss Landing natural gas-fired power plant that includes units 1 and 2 with a combined total of 1,020 MW and units 6 and 7 with a total of 1,509 MW. Dynegy also owns the 165 MW oil-fired Oakland plant and has transmission rights at the site of the 650MW Morro Bay plant that shut down in 2014. Dynegy wants to sell the plant. However, uncertainty over California's once-through-cooling regulation that will reduce water intake for power plants and its impact on Moss Landing is a negative factor for potential buyers. Dynegy hopes to have the final approval extending Moss Landing's cooling-water compliance date (2017) by three years to late 2020 from the State Water Resources Control Board. Aerial view of Moss Landing, Monterey County, California, USA. U.S. Army Corps of Engineers, photographer not specified or unknown - U.S. Army Corps of Engineers Digital Visual Library. To meet California's new emissions standards and reduce pollutants from the current facility, the Los Angeles Department of Water & Power undertook the repowering of Units 5 & 6 with a new 600 MW simple cycle power plant. Haynes Generating Station is a natural gas and steam power plant located in the City of Long Beach and built in the mid-1960s. The station currently has seven power generating units with a combined capacity of 1,600 megawatts- enough to power approximately 1 million homes. In 2005, LADWP repowered Units 3 and 4 utilizing advanced combined cycle technology, which significantly increased fuel efficiency of the plant. The Haynes Generating Station Repowering Project will replace two aging power generating units that now use ocean water cooling with six 100 megawatt fast start natural gas combustion turbines. These turbines provide “peaking” capability to meet the City of Los Angeles’ energy needs and better enable tracking the variation in power supply provided from wind and solar energy generation – a growing part of LADWP’s power supply. The turbines will also use “dry cooling’, completely eliminating the use of ocean water for these units. HAYNES NO. 5 AND NO. 6 REPOWERING PROJECT- LONG BEACH, CALIF. The Los Angeles Department of Water and Power (LADWP) broke ground in 2011 on repowering the Haynes Generating Station in Long Beach. The Haynes Repowering Project is the first of a series of repowering projects designed to eliminate the use of ocean water cooling—a process known as “Once-Through Cooling” at three coastal power plants. The new units are akin to jet engines that can ramp up to full power in just 10 minutes, as compared to the existing units, which require about a day and a half to reach full capacity. The Huntington Beach Desalination Facility will provide 50 million gallons of water per day (50 MGD) and will be located adjacent to the Huntington Beach power plant. The facility is scheduled to be operational by 2019. Construction of the Redondo Beach power plant was completed in 1967. The plant generates 1,310 MW of electricity, enough for more than one million homes. AES plans to replace this facility with a smaller, cleaner, more efficient generating facility that will eliminate use of ocean water for cooling. AES Alamitos plans to replace their existing plant with a modernized natural gas facility that is more efficient and responsive. The Alamitos Energy Center (AEC) will be a natural gas-fired, combined cycle, air-cooled power plant with the capacity to power millions of homes and businesses. On December 27, 2013, AES Southland Development, LLC submitted an application to modernize the existing Alamitos Generating Station (AGS). The original application was revised and the proposed AEC would include a nominal 640-megawatt (MW), natural gas-fired, combined-cycle power block and a 400-MW simple-cycle, air-cooled electrical generating facility. Power Block 1 would consist of two natural gas-fired combustion turbine generators (CTG) in a combined-cycle configuration with two unfired heat recovery steam generators (HRSG), one steam turbine generator (STG), an air cooled condenser, an auxiliary boiler, and related ancillary equipment. Power Block 2 would consist of four simple-cycle CTGs with fin-fan coolers and ancillary facilities. Demolition of retired Unit 7 and construction activities at the project site are anticipated to last 56 months, from first quarter 2017 until third quarter 2021. Existing Alamitos Generating Station Units 1–6 are currently in operation with a net generating capacity of 1,950 megawatts (MW). The proposed project site is bounded to the north by State Route 22; to the east by the San Gabriel River; to the south by 2nd Street; and to the west by N. Studebaker Rd., in the city of Long Beach, Los Angeles County, California. The California Public Utilities Commission approved Oxnard’s Puente Power Project at a May 26, 2016 meeting in San Francisco. In a 5-0 vote, the commission unanimously approved a contract between Southern California Edison and Houston-based NRG Energy to build a 262-megawatt peaker plant on the site of the 57-year-old Mandalay Generating Station. The project is expected to be finished by the end of 2020.
month) moratorium on any energy development in Oxnard while the coastal plan and ordinances were being modified. The proposed units are quick start, low emission, smaller visual footprint, and use 99% less water than the current old units, which could use up to 176,000 gallons per minute at peak capacity. NRG would employ “H Class frame peaker technology” for a new plant. units at the facility and included the demolition of existing structures and the construction of two full size units on the lower level and two smaller units on the middle level of the plant. The project replaced the plant’s Unit 3 with a highly efficient combined cycle (natural gas and steam) turbine and two simple-cycle turbines. Both the combined-cycle and the simple-cycle turbines have fast start and ramp-up capabilities for short-term increases in electrical demand and for more flexible integration of renewable energy. The LADWP says the new generating units are 33% more fuel efficient than the existing Unit 3 and feature advanced pollution control systems, thereby reducing emissions of air pollutants and greenhouses gases. LADWP’s Scattergood Generating Station is a 55-acre facility that provides energy to meet base load requirements within LADWP’s electrical power service system. The station was built in the late 1950s and has three existing conventional steam turbine generators that burn natural gas in boiler units for a total gross capacity of 830 megawatts (MW). Capacity for Scattergood Unit 1 was lowered to meet air quality standards and Unit 3 was replaced by a highly-efficient, combined-cycle generator consisting of a steam generator and a natural gas combustion turbine generator, similar to a jet engine. Heat exhaust from this engine are harnessed to power a secondary steam generator to complete the cycle. In an effort to modernize, the LADWP says that over the next 5 to 15 years, it will replace over 70% of existing power generation with major investments to modernize its infrastructure, meet renewable energy and energy efficiency goals and eliminate the use of coal power. Note: SONGS Once Through Cooling (OTC) phase out was scheduled for December 31, 2022. Coastal plants can meet the once-through cooling compliance schedule by shutting down, adding cooling towers to reduce water withdrawals by 95 percent or more, or by constructing a new power plant on the same site using dry cooling or a cooling tower to eliminate or minimize water withdrawals Sierra Club Id., p. 15. Id., The Orange County Register at 4. Guidance Document for Addressing Air Quality Issues in General Plans and Local Planning A Reference for Local Governments Within the South Coast Air Quality Management District, May 6, 2005, p. 1-10. EPA 6 Criteria Pollutants: Ozone, Particulate Matter, Carbon Monoxide, Lead, Nitrogen Dioxide and Sulfur Dioxide. Ozone, suspended particulate matter (PM10), fine suspended particulate matter (PM2.5), carbon monoxide, nitrogen dioxide, sulfur dioxide, sulfates, lead, hydrogen sulfide, and visibility reducing particles. Id., Sierra Club, pp 13-14. Note: The Sierra Club report totally ignored smog and environmental justice. Id, Sierra Club, p. 2. The Tribune, San Luis Obispo, Feb 22, 2014, Dynegy Officially Closes Morro Bay Power Plant. The OTC policy created a permanent advisory body – the Statewide Advisory Committee on Cooling Water Intake Structures (SACCWIS) 1 – that is scheduled to report annually to the SWRCB. SACCWIS includes seven organizations: California ISO, Energy Commission, CPUC, California Coastal Commission (CCC), State Lands Commission (SLC), California Air Resources Board (ARB), and SWRCB.